In order to meet the challenges of complexity science the BCCS recruits PhD researchers from diverse academic fields. 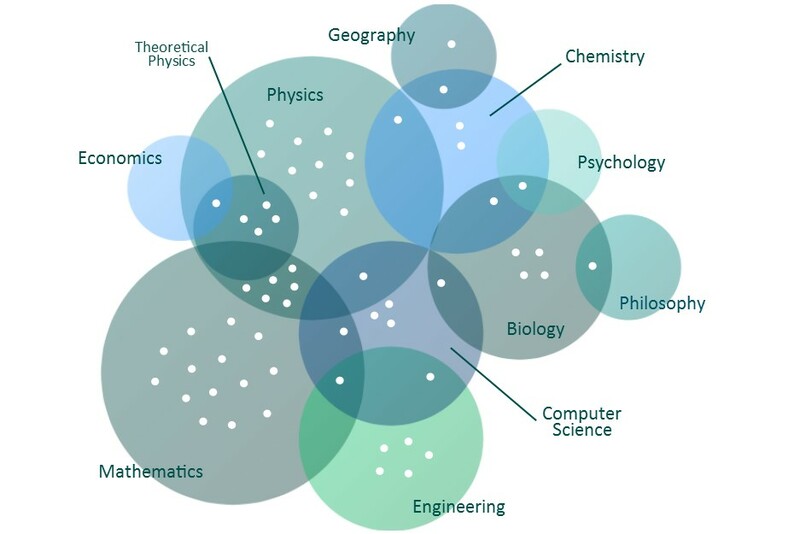 Our PhD researchers have proved their academic grounding during undergraduate and often postgraduate study in a wide variety of subjects illustrated in the diagram below. It's crucial to our success that we bring together researchers with different perspectives, knowledge, and experiences to develop novel approaches to the real-world problems our research addresses. In addition, all of our researchers take on a further year-long taught component (part of a four-year PhD) designed to develop a breadth of knowledge of the vast array of theories and applications that relate to complexity science. This innovative programme includes teaching and input from staff across the University and the completion of two research projects working with teams of researchers in different subject areas - representing our commitment to interdisciplinary collaboration. Our collaborative and interdisciplinary research also inspires our outreach and public engagement activities.